Clare’s quilt ‘Flights of Fancy’ started as a painting made with many layers of acrylic paint which was then transferred onto cotton to be made into a quilt. She talks about creating the painting and then the quilt, as well as the techniques that she uses in her work. Clare finds meditation and yoga helps her to explore her creativity and inspires her work. Later in the interview she talks in detail about sewing techniques, fabrics and dyeing techniques, including vegetable dye, procion, indigo, shibori and woad, as well as balancing her work and family life. 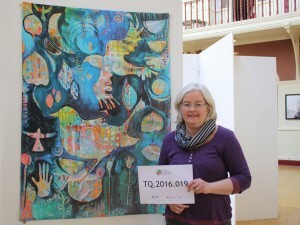 DS: Talking Quilts interview, 2016.019 with Clare Wassermann. Today’s Tuesday the 19th April 2016 and the time is quarter past four in the afternoon. We are at the studio of Clare Wassermann in Wolverhampton. Hello Clare. DS: Thank you for inviting me to interview you about your quilt. We’ve got this quilt in front of us and could you just tell me about the quilt. CW: Okay, this quilt is called Flights of Fancy and it’s taken from a painting that I did the year before I made the quilt. 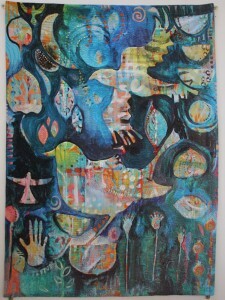 So the painting is about the same size of the quilt, maybe slightly larger and is done in acrylics in many, many layers. And is mostly just depicting birds, sea pods and… and flowers. And then I had the painting transferred onto cotton poplin and I’ve quilted it and embellished it from there. So it’s a whole piece quilt. DS: A whole piece quilt, yes. Can you just tell us about the colours that you’ve used in it and the acrylics, when you say acrylics you mean acrylic paints? CW: Acrylic paint yes. I used a lot of blues, certainly have in this quilt anyway, ranging from very dark blues and into turquoises and a pale teal which is probably one of my favourite colours. And then I’ve used contrasting, oranges and yellows, and some greens as well which give good value contrast. I work in lots and lots of layers so with the painting I start with oranges and yellows and warm colours. And then I build up the layers, letting each one dry so I start with warm colours, I let that dry and then I move onto the cooler colours from the spectrum, the blues and greens. And I make marks all over the canvas, I just have a whale of a time, mark making, using my fingers. I rarely paint with a brush, I use my fingers and sponge and, forks and scratching tools and all sorts of varieties of mark marking implements. And then I add it… and then I let that dry and I go back to warm colours then back to cool colours and that way the colour’s never muddy, because if you mix two colours from the warm end of the spectrum and the cool end of the spectrum you’d get muddy brown colours and that… that’s not what I want to achieve for this. So many, many, many layers and then I look to see what I’ve got and I start to pick out shapes or forms so I never know what I’m going to do when I first start a painting, it’s purely abstract. And it gradually becomes more figurative as time goes on. And so I look to see what there is and… and pick out certain shapes and birds were starting to emerge and they are an important theme for me anyway in many of my paintings. And then eventually I carry on working the background in almost like a negative space and then embellishing that with more marks to decorate and balance it out. And then balance the colours finally at the end, it’s quite a process. So probably all in all there’s 20 layers of paint in a painting. DS: Yeah, that’s amazing. So this… this quilt first originated on a canvas and then it was transferred onto the cotton poplin. CW: Yes it was… yes it was digitally transferred. CW: Well, I don’t, it’s my own technique [laughs]. I haven’t labelled it because people do say to me what do you paint and I find it very hard to describe what I paint and I don’t know what the style would be called really but I suppose it’s abstract expressionism into something that becomes more symbolic and figurative over time. And I find it a very exciting journey really because I don’t know what the picture’s going to be to begin with. CW: The nature world I think is the thing. DS: Yeah, I was going to say, where does your inspiration come from for your work? CW: My inspiration really is I, I do a lot of yoga and meditation and I suppose that unlocks some kind of creativity in me and I’m interested to explore that further all the time. And then the philosophy of yoga also comes in which is about harnessing mind and body. So in a painting… in the act of painting, I find that I’m trying to bring the two together, to come up with a creating outcome. And I think that yoga also releases emotions and creativity by releasing the body where I think we store our creativity and our … and our trapped emotions. So, doing some yoga or meditation before I start to paint is always really helpful in bringing movement into it and then when I’m painting I use my body. So I said I use my fingers but I put music on and I dance sometimes and, and just enjoy the act of it. I’m keen to explore that further with other people actually, yeah so that’s… and I suppose other… other than that the symbols that I use, are personal to me. I’m quite interested in using symbols that really mean something, so, for example, the sea pods are to do with, potential and growth and starting with what you’ve got and moving to what could be. Birds are a symbol of freedom, spirals are a feature that’s found in nature a lot. Obviously plants and leaves and flower shapes inspire me anywhere, I just love the shapes of them. And yeah, birds I think are quite important because it represents that freedom of flight. DS: Yeah, absolutely. So did you say when this… when this quilt was made… it was made for an exhibition recently. CW: It was made for an exhibition in 2015, I painted the painting in the end of 2014 and I’m member of a local quilt group and we had an exhibition. No, it’s not a local quilt group actually, it’s not the local quilt group it’s the Embroiders’ Guild and it was for our exhibition at the Red House Cone in 2015. So I had it printed it up and I did what I could with quilting it little by little, I have to say. I found it quite tiring quilting and I’ve only got an ordinary small machine, would love to have a long arm quilter but I don’t think that’s ever going to happen. And so I had… there’s nothing like a deadline, so it took me probably eight months to make it and I was really racing against time and just typical of me, I was putting the binding on the night before [laughs]. And looking up how to actually do a faced binding which I hadn’t done before. DS: Can you just describe some of the quilting that’s within the quilt… within this particular quilt? CW: Yeah, I’ve used machine quilting… free machine quilting in a swirly sort of pattern that reverses on itself. And I’ve repeated that swirly pattern all the way through using various colours. So sometimes a colour is a bit darker than the quilt to deaden it and to send the background back a little bit. Sometimes it’s a contrasting colour the orange against or gold against blue. And sometimes it matches in quite closely with the colour of the quilt underneath and then I’ve hand stitched as well. So, on the main symbol which is a big bird that’s in the middle, and a kind of cupped shaped affair at the bottom and some of the other birds along the side. I’ve… I’ve hand embellished that with threads that contrast. I think that’s something that I really like actually in both paint and in stitching is contrasting. So, I try to find colours that sometimes buzz against each other so for example there’s a turquoise part on the neck of the bird which is turquoise on the fabric but I’ve used a very bright red. And when you look at that, well to my eye anyway, that almost vibrates. So I’ve tried to incorporate the way I paint into the way I would stitch as an embellishment. And there were two beads [laughs], two beads one for each eye of the two major birds in there. But beyond that there’s no other embellishments. DS: So with your threads, do you use commercial threads or are… are these hand dyed threads? CW: I think they’re all commercial threads in this one. I’ve used quite a lot of perle because they often have really nice bright colours and I’ve used some wool, I think it’s called Lana thread and a little bit of rayon as well because again they have lovely bright colours to them. But a real mixture and I…I really just use what I have. I didn’t go out and buy anything in particular for this one. I… I just looked through my massive stash which I’m sure we all have, and found things to contrast. I think the difficult part actually with this was knowing when to stop, and I think the answer to that was probably that I stopped when the time ran out because of that. [DS: On your deadline?]. Yeah, because there are places where I could’ve gone further and I think it’s almost infinite what you could do with something like this. You could really go very dense with it all but, as I say, I ran out of time and sometimes you’ve just got to go, well okay that’s it. DS: So you mention that this quilt’s actually been in an exhibition recently. Would you like tell us about that? CW: Yes it’s, it was as I said, the Embroiders Guild, the local branch of the Embroiders Guild, Wolverhampton. And we … it’s quite near to Stourbridge, it’s probably about eight miles from Stourbridge. And there’s a beautiful setting for exhibitions in the Cone which was a glass factory. And attached to that in the modern centre is a beautifully lit gallery and we had an exhibition there with about 50 pieces in it. Mostly quite small but this was quite big because, you know embroidery generally tends to be small objects. So this one stood out quite a lot but it was a nice place to be because the lighting was so good and we just had natural light. DS: What plans have you got for the quilt now? CW: Hmm, well it’s just been in an exhibition as well here at the New Hampton Art Centre at which was an exhibition entitled, I Am. And, it featured in that because this is… this particular picture is about the inside of me which is representing the things I mentioned earlier, freedom and flight and sea pods and potential. So it’s just come down from that and I think it’ll be folded away for a little while but see whether it will emerge at another one. I’ve made another one since then which is now in an exhibition, again along a similar lines, made in exactly the same kind of way but with a new painting. And my intention really is to keep going with this and produce one quilt a year in with quilting because I go a bit go a bit cyclical art and embroidery and quilting. You know, I… you know, heavily involved in painting and leave the sewing alone and then I come round to sewing again. So just doing one a year keeps my hand in and I like that. DS: Do you remember when you first discovered quilting? Has it always been there or is something that you just found in recent years? CW: No, I didn’t sew at all as a child. I really envy people whose parents or whose Mum sewed or whose Granny sewed but mine, my Mum couldn’t sew a button on. And so from the age about five I sewed by Dad’s shirts buttons back on because she was not going to pick a needle up because she would’ve thrown it threw the window, she used to get so cross with sewing. So I used to do that and … and just little minor repairs and things but apart from that, I didn’t sew and I made a pair of curtains when my… my son was a baby which was 17 years ago. I bought a sewing machine and didn’t know how to thread it and I had to keep looking at the instructions. Anyway I did that and then I made perhaps another pair about five years later and had to re-look at the instructions. And then, I really didn’t touch it but I was a mum in the playground, got talking to another mum and we shared an allotment space together and I went back to her house for a cup of tea one day and she had all these quilts that she had made and I’d never seen anything like it. I didn’t really know anything about quilting and I was just blown away, her whole house was set out like some kind of New England boudoir, it was just fabulous [laughs] with all these gorgeous patchwork quilts. And she was a pattern follower, and I just… I just couldn’t believe how she’d actually cut up all those squares of fabric and put them back together in all these lovely designs. And I wanted to know more about it so she pointed me in the direction of how to start my first quilt and I had a go and she massaged me along the way with it really, and telling me what to do next and I was hooked. And then I joined local quilt group, One Born Quilters in Staffordshire and heard some really inspirational talks, I think the first person that I heard was Ineke Berlyn. [laughs] I think it was my first visit to this quilt group and she had these three suitcases of quilts which she talked about and she just kept pulling one out after the other and there were very arty. And I was just really fascinated with this next sort of style of not following a pattern but being more artistic with it. And then I was really inspired and hooked and I… I made quite a lot of pattern led quilts in the sort of New England style. And then went to workshops with the quilting group and gradually enjoyed doing more of a free motion quilting and drawing with a sewing machine became what I really loved doing. DS: You mentioned free motion a couple of times now, can you just tell us a little bit more about free motion, what exactly it is. CW: Okay. Well, I suppose the best way to describe it is drawing with a sewing machine needle. So you put down the feed dogs which are the tooth mechanism underneath the needle of the sewing machine which guides… normally guides the fabric into the nice straight line. You put those down so you’re not using them and then you move the quilt and you put your foot down fairly hard on the .. on the needle so it’s moving up and down fairly quickly and you move the quilt so… it’s like moving the paper and keeping the pencil still with drawing and really you can just… you can draw, you can letter, you can make patterns and you have to be fairly relaxed to be doing it because otherwise you can stop and start and get corners where you don’t want them. But it becomes something that’s almost second nature I think. Does that explain it? DS: I think so yeah, that’s pretty good how explanation. Do you remember your first quilt that you made? CW: Hmm, the first quilt I made was a whole cloth quilt actually, it was a printed what do you call them, a printed panel. CW: And it was a picture of a sort of typical a New England house with a speckledy background and some birds in it funnily enough now that I think about it. [laughs] And, I just quilted round the edge of the house lines and then round the edges of the borders and then I did my first little bit of free motion quilting which was a little bit jaggedly really but you know, I couldn’t get the stitches to become the same length all the time. But, it was a first attempt and I did like making it. DS: Yeah, that was really brave for your first attempt to do free motion quilting wasn’t it really? CW: [laughs] Yes, I suppose so. Yes, yes, it was but at least I hadn’t had to piece the quilt together which is a whole another set of skills with all the careful measuring and cutting. And actually that’s not my style and I did do that quite a long time but I think if you can understand the way I paint it’s not a terribly careful way of painting and I don’t think I’m a very careful neat person and I can do the cutting but it goes against my grain really and I do get a little but kind of uptight with it. So I think that’s why I’ve enjoyed evolving into something that doesn’t involve cutting up tiny fiddly little triangles et cetera. DS: Do you find piecing a quilt quite restrictive? CW: Hmm, yes, yeah, I mean over the time I find pattern following just boring really. I… I love the look of them, I just love looking at people’s quilts, I’d love to have my house full of them and I’ve got quite a lot but I don’t want to keep on following somebody’s pattern because that doesn’t feel particularly artistic to me. That’s… that’s more of a craft and it quite rightly has a very, very important place in quilting but it’s not so much my style now. DS: You mentioned Lynette Jensen in your per-interview questionnaire. Just tell me about her because I’ve not come across that name. CW: She compiled a series of books called Thimble Berries, is it the right person isn’t it? Lynette Jensen, I’m sure it is. It is. I’ll say that little bit again. DS: We can take that out afterwards if you’re not sure. CW: Okay so, Lynette Jensen complied some very good books on quilting and telling you how to piece together quilts the right way and how to cut properly with the right, you know, grain of the fabric and without stretching the borders and this that and the other. Very informative books and I… I really did enjoy working my way through quite a few quilts and under her guidance really on paper. And I think I’ve learned most of all that style from books and the internet rather than being taught face to face. DS: And you think you learnt that basics of quilting from those books? DS: So you preferred styles of techniques in quilt making what you’ve talked about… open about today. The piecing taking a side step now and… and you’re concentrating on the … the art side. CW: The art side yes, I do like also quilting a collage so I’ve made other quilts which are more arty as well. So that’s not a printed piece of fabric it’s collage bits and pieces including paper, including plastics sometimes, foils, muslin, scrim and patch… patching them together but not in a pieced way as a collage, one on top of the other overlapping sometimes. Lovely little frayed bits, and then drawing with the sewing machine onto… onto the top, almost sketching on top of that as a background, and I think somebody who I really admire in that sense is Cass Holmes. DS: Okay, can you tell us a little bit about Cass. CW: Cass. Yeah, she lives in the South of England, she teaches and she produces most beautiful quilts using quite often found objects and found materials. Always up cycled, always very soft so they’ve got a lovely feel to them and yeah, she layers and overlaps. Sometimes she scrunches up paper in a technique called momigami which is a Japanese technique of folding and scrunching paper so that eventually it becomes back to the rag that it once was. And that’s wonderful for stitching on, it’s very strong, it’s even waterproof, you can make clothes out of it because you oil it at the same time as scrunching it. And then she… she tends to draw sketches of plants and the natural world, birds quite often so it’s probably why it appeals to me. And I… I did go to a class of hers actually, it was wonderful day, and I used that a lot in my smaller pieces. So they’re more hangings rather than quilts for the bed. DS: So you’ve spoken about you attended a workshop with her. Have you attended any other workshops recently? Or is it all of our own work now an inspiration? DS: Too much time sleep and not enough quilting. So what types of technology do you use in your quilt making? CW: Hmm, fairly basic really. I… I have a nice machine and I’ve got a Bernina quilter sewing machine which is really an ordinary sewing machine, very good quality I think but it’s got a slightly wider throat than a normal domestic one, so I just use that. It has got a stitch regulator on it which I sometimes use and sometimes it’s a bit annoying because it stops working or I can’t even get it to work and I just think, ‘Oh well, I’ll just do my free motion.’ I can do it reasonably well without it so sometimes I use that and sometimes I don’t. And then, it’s just good old needle and thread, I don’t have any other particular technology. DS: I’m just going to ask you what a stitch regulator is. CW: Hmm, it’s a little electronic attachment that fits on… behind the needle and it regulates the length of the stitch. So if you’re moving the fabric at a certain speed it will stitch at that speed and then if you’re moving the fabric quicker it will keep the stitch length the same all the time. So that’s really useful when it’s doing it, when it’s supposed to be doing it or when I’m doing what I’m supposed to be doing with it. I can never remember the settings so I’m always pressing all sorts of buttons because I use it quite infrequently. Sometimes I get it just right and then of course the next time I come to use it I can’t remember which setting I’m supposed to put it on [laughs]. DS: Because you do a lot of yoga and natural things, would this technology be… would you be a bit anti-technology or does it all come together quite nicely? CW: I think it comes together quite well really. I’m… I’m pretty happy with what I’ve got although I do look with envy at long arm quilters where I can really stand up and see the whole quilt spread out in front of me and be able to see exactly where I’m going. And with a long arm quilter you’re moving the arm of the machine so it’s the other way round, you’re not moving the fabric you’re moving the arm of the machine. It’s much more like drawing and I do sort of envy that… that amount of space that you could have in front of you but I don’t think that’s anything that I’m going to ever have. CW: No, well maybe one day if I win the lottery. DS: One day when you sell one of your beautiful quilts. DS: Be a nice deposit for one. DS: So do you, you transfer your designs onto… onto your fabric, so where did the idea of doing that come from? CW: Yeah, the idea of that actually came from Linda and Laura Kemshall. They luckily local to us and they’re fantastic internationally known quilters and they live five or six miles away. So they’ve got a wonderful printer which digitally transfers your image which I’ve always had scanned, rather than photographed because it gives a better result. They transfer it onto whatever fabric you like so you could have it done onto silk or velvet or linen or a variety. I use cotton poplin because it… it’s got a close weave and it takes the dye well. But I have had various other things printed onto velvet which is absolutely gorgeous because it soaks up so much dye you get a real good depth of colour but it’s very expensive velvet, it’s about £65 a metre so, that’s just for special occasions [laughs]. But for wall hangings, I think the cotton works really well. DS: Have you done… ever done any dyeing of your own fabrics? Or is it always paint work? CW: No, I have dyed my own fabrics, in fact I’ve just made a collage quilted dress for the same exhibition that I’ve mentioned about I Am, my identity. And that was put together as collages fabrics and papers and then I dyed that afterwards, well, I painted that with dye to tie the whole thing together but I have used natural dyes, I quite like using natural plant dyes ’cause I’m interested in the eco side of dyeing, I try not to put too much stuff down the drain. And that goes the same with acrylic paint, I don’t wash stuff away, I make sure I scrape it up and then it’s thrown away rather than down the drain. And I’ve also used procion dyes, chemical dyes as well, from time to time just to get different shades. I don’t particularly now buy pre-printed fabric at all. I did have a big spell and hence I’ve got cupboards and cupboards full of it, my stash. But, not using it at all at the moment, I’m sure it’ll come back to me though when I’m into my next phrase of making quilts. DS: You mentioned the plant dyes, what sort of colours do you get when you’re using plant dyes? CW: It’s a plant, yes. you have to be a bit careful how you grow it ’cause it can spread but, I was going to plant it in my allotment until I learnt that and, no, we’ll not be eating woad that wouldn’t be a good idea. So you can grow it in pots and it’s a leaf and it’s very similar to the way indigo is processed. CW: It’s very ancient, an ancient dye that was used to get our blues hundreds of years ago. DS: And procion dyes, can you just tell us a little bit more about the procion and now that works. CW: Yeah, procion dyes are chemical dyes that are easy to buy in powder form. Very, very simple to use. The way I normally do it is I would soak my plain fabric or fabric I’m going to dye in water with some soda ash or soda crystals for an hour or two. And then I would rinse, drain it out, wring it and then I would apply the dye in one or two ways, either dipping it into let’s say if it’s small pieces into a jam jar, scrunching it up and dipping it into the procion dye which you’ve previously mixed with water. Or I would use that procion dye to paint onto the fabric you can paint different designs and use different colours, so yeah two ways of doing that. Or actually I’ve done it with batik as well, that’s a nice thing to do with batik wax as a resist. DS: batik. Is that another technique that you use a lot? CW: Not a lot [laughs] but I have enjoyed doing it in the past with a tjanting, a little device for spreading the wax, to draw a design and then to dye the fabric, and then to iron off the wax and then you’ve got your plain fabric or previously dyed fabric underneath. And that’s quite an exciting thing to do, it’s just that there’s not enough hours in the day to do all of these things. DS: There’s lot of different techniques you’ve mentioned, you sound as though you’re having great fun. DS: So you mentioned the Wolverhampton Embroiders… is it a Guild? CW: It’s a Guild, yes. DS: And it sounds a fascinating group, so how long have you been a member there? CW: I think I’ve been a member about seven years and, we’re very lucking, I think we’re one of the most active groups in the country. We have a lecture every month and we have a workshop every month, and we’re always have interesting people to talk. And we’re a group that’s growing, there’s more younger people coming into it which is good but I’d say we’re more of a textile group than what you might think an Embroidery Group is. I have learnt such a lot, you know, considering that I couldn’t sew before about ten years ago. I’ve learnt a lot from them and from the quilt group that I belong to. Yeah. DS: That was Wombourn Quilters? CW: That was Wombourn Quilters, yes. DS: And how long were you a member there for? CW: Well, I think I was a member for about five years there and I… I do really like it and the only reason I stopped is that I’m doing so much painting at the moment and I’ve got some book illustrations that I’m doing. But, I just absolutely can’t fit everything in so I’ve taken a short break from them but I’m… I’m sure I’ll be back. It’s just time and family and all of the other commitments that have taken me away from it for now. DS: So do you have any involvement other than as a member of the Embroiders Group? CW: Well, we can run our own workshops so I haven’t done that yet but they have booked me next year to do a talk about my progress which is really wacky because I’m actually talking about their own group and what [laughs] and what I’ve done with them. But, I did talk to the Wolverhampton Society of Artist in January and, that went down really well. I brought in all my sketch books and all my ideas books and I think it’ll be quite fun to take that to the Embroiders Guild as well to show them some of the processes that are going on in my head before attack a piece of work really. So I shall enjoy doing that, yeah. DS: So you sketch books, I have seen some examples and they… they’re amazing, I love people’s sketch books so does it play a bit part in your… in your work as a… as a quilter? CW: Yeah, it… it plays a really important part actually, more and more as I go on because I think I get more and more ideas from the ideas that I get and I’ve got to get them down onto paper somehow. But I use… I also use a sketch book as a form of meditation because it’s a very focused quiet occupation and it enables me to process my thoughts as I’m working in the sketch book. Often I don’t really know what I’m going to do and when I … and I really try to do something every day. But I… I like to work with symbols and play with paint and fabric in there and stitch and and printing and all sorts of ideas to sort out what I’m… what the symbols means to me and… and where they might then apply to a bigger piece of work. So they’re always a catalyst to further creativity. DS: Is that something you do at the end of the day? Or anytime during the day? CW: At the end of the day is probably not a good idea for me because I wouldn’t be able to sleep afterwards. It’s actually really good to do it first thing but family commitments sometimes doesn’t allow me to do that but really any opportunity. I always leave a sketch book out at home, I’ve got a table with paints and inks and gesso and a great big mess on it really. And so any chinks of time that I can in the day if I have half an hour I will probably go to it and start something and then leave it in process so that I can come back to it. I’m quite often burning the tea, you know, the children do often say, ‘Mum the tea’s burning again.’ because I’m [laughs] I get… ’cause the hours just disappear with creativity don’t they and I do forget the important things of life sometimes, and school uniforms being washed and ironed and everything, doesn’t always happen. But I try to… I think that’s my… people say to me, ‘How do you do so much?’ and I think, ‘I don’t waste any time.’ I try to use all the little chinks of time for something that’s to do with my creative pursuits and I don’t watch much television. DS: So you… you work at home but you’ve also got this beautiful studio here in the New Hampton Art Centre. DS: So how long have you been here and how… how did this all come about? CW: [Laughs] I’ve been here for three months so I started in January this year, 2016. It came about because there’s two men here who have put a certain amount of money each into trying to make Wolverhampton into a home for art. It’s been a cultural desert, some people might say, for many, many years, quite a impoverish town in many ways and the arts have been sadly neglected. The Art Centre here itself has had its funding completely taken away from it by the Council and these two guys have come in as trying to start a collective of artists. We’ve restored, between us on a volunteer basis, we’ve restored this beautiful Victorian building into an art gallery space, which can be used for other things. And around it is a beautiful gallery with studios which people can rent and last year in December I was invited to put some paintings into an exhibition, their first exhibition here, Art Fair we’re calling them, which I did. And I came and really I was looking around at these studios and I was thinking, I would just to love have one of those. Didn’t really seem very practical but there was half a studio going and I do share it with somebody, we’ve got partitions down the middle so we, you know, we can put our own things up. But, I just thought I’m just going to go for it even though I can’t necessarily afford it and it’s been the best thing that I’ve ever done because it’s got a really good creative buzz here. There’s people in the open office who are now promoting what’s in Wolverhampton and exhibitions that will rotate around venues in Wolverhampton. 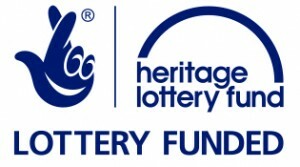 And we’re also trying to make an area here on the west side of Wolverhampton into an artist quarter to bring that area into regeneration and to make it a centre for artist’s work. So it’s been wonderful having this studio because it enables me to really concentrate especially on painting where it dries so quickly my form of painting that I need to move on, I can’t stop and talk to [laughs] my family members or entire the dishwasher in the middle of a painting when I’m on a roll because it would all dry and then I couldn’t manipulate the paint. And also, it’s going to give me the ability to give some workshops here which is a new venture for me this year. CW: Yeah, it is exciting, I feel very excited and all sorts of new things have happened that weren’t happening before. I was just working in isolation, I think just because you bump into people here you get into conversation and we all work for each other so if one person needs help with something they’re doing you all muck in and then, you know, that pays back because then they’ll be an opportunity for you to exhibit somewhere and it is well a collaborative, yeah. DS: So you’re feeding off each other really. CW: Yeah, yeah. That creative energy is wonderful to be around because anything goes really and nobody’s… nobody’s weird here. I mean, there’s some really wacky people but we’re all just normal here whereas [both laugh] in my other circle of friends, my kind of more domestic friends and my family, I’m the wacky one and now I’m the more sensible one in this arts venue. DS: You sound disappointed [laughs]. CW: Well I’m working towards being more wackier [laughs]. DS: So do you get time to quilt here or is that something you do at home? CW: I did start off quilting here, I just brought the sewing here ’cause I wasn’t quite sure whether to bring my paints or not because my worry was that if I didn’t have my paints at home I’d want to paint at home. So I started off with quilting here in fact finishing a big quilt that I just needed to put my head. And it was great because I could spend three hours at a time getting the work done and not being interrupted. But then I decided actually that the sewing could stay at home in a more clean environment and then all I’ve done is bring all my paints up here and so this is really where I do the painting but that might change, it could be flexible I think. DS: Yeah, wherever you go you’ve got it. DS: So you exhibit, do you attend exhibits yourself? Do you go to quilt shows? CW: Yes, I do, of course. DS: Which ones do you attend? CW: Well, of course I love the NEC, I don’t know what it’s called actually the International Quilt Fair at the NEC in August, I didn’t go last year and I can’t wait for this year’s one because it’s been too long. I love looking at the quilts, I think it’s fantastic but you’re always pulled between looking at the quilts and buying from the wonderful trading stalls. And … and this year, I’m going to try and go twice because I think I need one day to look at the quilts and one day to spend my money. But, yes, I always… I’m always interested in where there’s textiles exhibitions and painting exhibitions. In fact I’m going to the Chelsea Art Fair on Thursday this week, to see you know contemporary art and what’s up and you know, what’s happening down there. Yeah I love going to exhibitions, I think you just get so many ideas, things that you’ve never thought of. It’s wonderful, you know, there’s so much creativity. DS: What… what do you look for in a quilt or what do you notice? What… what makes you… what draws you to a particular quilt? CW: I think for me it’s always to do with contrast. I love value contrast, lights and darks. It always draws me. I’m… I’m not a fan of pale and wishy washy quilts unless it’s for home décor in which case a nice antique looking quilt is absolutely gorgeous but I’m looking for something with a bit of zing really. It doesn’t have to be brightly coloured, it could do it in black and white for me, monotones but yeah, colour… a creative use of colour and texture. Of course that’s the thing with quilting is that I think it’s probably what drew me to it was that you’re adding texture, you know, you really want to touch it don’t you? It’s a shame in most exhibits you can’t, but it adds that extra dimension when you look at it. I love looking at quilts sideways where you can see all the ripples; I love Katha stitching where you get waves of, the fabric rippling. So I’m looking for an exciting amount of texture and colour variation and… And, contrast. DS: Do you think art quilts are here to stay or do you think the traditional quilt will overcome, shall we say? CW: No, I don’t think there’s a competition between the two at all, I think they’re totally separate and, and then sometimes actually they interact and I quite like the idea of putting a bit of old beautiful old hexagonal quilting piecing into a piece of contemporary art, why not? I just think there’s a room for everything and I just love all of it, yeah. I love the history of all the pieced quilts as well, you know that I think something that’s captures my imagination is women working together. And I think there’s a lot to be said for the Amish community and the bringing of women into groups and I think that’s going back to The Embroiders Guild and The Quilters’ Guild is bringing women usually together. And it creates conversation and people talk about, not only the work that they’re doing but it opens up other conversation. There’s a wonderful group here in Wolverhampton for refugees, they’re all settled in their houses but somebody has started up a group for stitching. It’s not necessarily quilting but it could be, and it’s really to enable women to come together, to talk and socialise because they’ve … they’ve got the practicalities sorted out but they haven’t got a social life and there’s nothing like sewing together to bring people together to talk and process. DS: I mean, and that is what quilting’s always done hasn’t it over the centuries. I mean, especially the Amish they would have their quilting bees, so in your way you’re talking about a modern quilting bee. CW: Absolutely yes, and it does bring us together and form friendships between young and old. I mean, there are young quilters now who mix together with older people that they may not have spent with before. But because you’ve got a common interest, it’s lovely, it brings people together and share stories and [inaudible]. DS: Do you find it empowering quilting? CW: Yeah, I do, yes. It certainly led me, back into all sorts of artistic creativity that I might have left alone with small children because I was otherwise occupied. It’s brought me back into something the arty side of thing that I was doing when I was growing up myself, yeah. 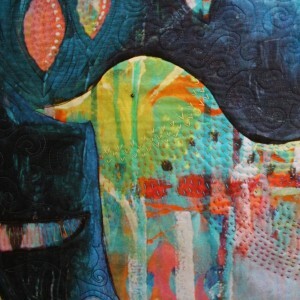 DS: So is quilting a new thing in the art world would you say or has it always been there? Or is it becoming more… more accepted? CW: I think it’s becoming more accepted, I think about ten years ago we were having this argument whether textiles could be art or not and I think that’s [undecipherable] really these days. I think anything can be art, I mean, you know, it… recycled materials can be art, it depends how you put it together and the story you tell of course. But of course, fabric in… in art is important and stitched together is important. I don’t think… I hope we’re not having those arguments anymore really because they’re very outdated. I just don’t care whether it’s art or not because I don’t think you need to label things in that sense. I think it’s here to stay though. DS: People do talk about modern quilts don’t they? Do you think there is such a thing as a modern quilt now? CW: Hmm, I don’t really know what the word modern means. Does it mean over the last century, could do but yeah, I think it’s like art and modern art, I don’t really know what it means. Modern music is really difficult, people say… still say you know, the music from 100 years ago is modern music, and Shostakovich he lived a 100 years ago and they say it’s modern but it’s not. And it’s… I think you could maybe think more avant garde would be some of the more wacky, harder to resolve in your own mind, quilt making, and sometimes you need a bit of an explanation as to what the idea of the artist was to understand it. But I, I like to look at something and decide for myself. I don’t necessarily want to have a big story behind it. I like to make my own stories sometimes for more contemporary work. Yeah. 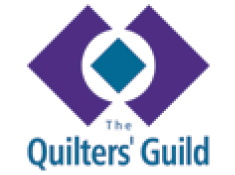 DS: So… so what do you think your… the biggest… your biggest challenge is today as a quilter? CW: [laughs] to keep quilting [laughs], yes to keep it up, just keep up my skills and to keep at the moment to make one a year and then to see where that then takes me. And also to not get stagnant. I don’t want to keep on doing the same thing for, you know, for ever and a day, it’s evolving I suppose is my biggest challenge, evolving. DS: And finally, do you feel quilt making is an important part of your life? CW: Yes it is. Most definitely, it’s gained me friendships, relationships with people and a great deal of fun. I’ve just really enjoyed it. I wouldn’t do it if I didn’t enjoy it. DS: That was brilliant, Clare. Thank you very, very much, really interesting.